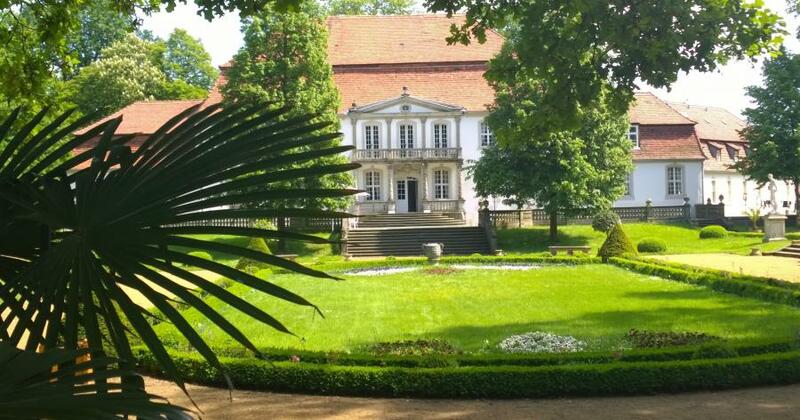 The Association of Friends, a registered non-profit organisation according to German law, is committed to assisting the Artist Residency Schloss Wiepersdorf (Künstlerhaus Schloss Wiepersdorf) as a place for lively debates, creative work and substantive encounters. It is supporting literary science and research with a special focus on Bettina and Achim von Arnim, European romanticism and its role as a precursor to modern and contemporary literature. Originally a typically baroque country house, Schloss Wiepersdorf was enlarged and embellished at the end of the nineteenth century. WIdely known for its achitectural harmony and intimate elegance it is considered one of the outstanding historic monuments in Brandenburg and beyond in the Eastern part of Germany. The fascinating history of literary and artistic creation make it a top destination for all those who enjoy reflecting and working in an inspiring architectural and landscape setting. Due to urgent basic renovation work of the historic building, Wiepersdorf Artist Residency was closed at the end of July 2018. It will resume its activities in 2020 under the new structure of a "Cultural Foundation Schloss Wiepersdorf", owned and managed by the State of Brandenburg. Traditionally, Wiepersdorf Artist Residency has been opened from March to November. Recipients of fellowships are housed in the castle annex in single rooms; a library, artist studios and exhibition space are at their disposal. Fellows are free to pursue their own projects and to participate in meetings and events taking place at Wiepersdorf. In the peaceful setting there are bicycles for rent and a shuttle service to the small town of Jüterbog, which has a railway connection to Berlin (40 minutes to Central Station). Wiepersdorf Artist Residency focuses on literature, visual arts and music. It is renowned for its intimate character and creative atmosphere. Artists-in-residence and researchers benefit from a unique opportunity to share experiences. They appreciate the tranquillity of the place. The proximity to Berlin, situated 80 km to the North, is seen as an additional advantage. Schloss Wiepersdorf is the historic home of Bettina and Achim von Arnim. Three years after their marriage in 1811 they moved from Berlin to Wiepersdorf. Both are key figures in German romanticism and became well-known all over Germany and beyond. Throughout her life Bettina von Arnim, née Brentano from Frankfurt with an Italian family background from her father's side, was passionately advocating greater individual freedoms and social justice. She was also struggling hard to reduce widespread poverty. The Association established a small museum in the Artist Residency devoted to the couple, to their works and to the history of the place. In her honor, a German emigré group supportive to the pre-revolutionary movement of 1848, founded a settlement in Texas/US named "Bettina". It was short-lived, however. Schloss Wiepersdorf remained in the Arnim family until 1945, when Soviet troops occupied the place. The last private owner of the three family estates Wiepersdorf, Zernikow and the medieval castle Bärwalde was Friedmund von Arnim, who died in 1946 as a prisoner in the Soviet Union. His sister. the painter Bettina Encke von Arnim saved Wiepersdorf from destruction. She managed to help transform the once private home into a public literary retreat for writers and artists and was supported by Ivan Katz, a former Communist and Jewish member of the Reichstag, who benefited from protection by Friedmund von Arnim and the Encke family during the Nazi-era. Starting in 1946, Schloss Wiepersdorf became a holiday home and place for studies in the GDR-era. A pre-requisite for writers to stay in Wiepersdorf after 1946 was a permission by the East German Writers Union, which became owner in 1956. Its first president was Anna Seghers, who often came to Wiepersdorf. Many residents, also from Eastern Europe, became attached to Wiepersdorf. On 4th April 1965 Schloss Wiepersdorf was named “Bettina von Arnim-Heim” on the occasion of her 180th birthday. Ownership was transferred to the “Kulturfonds” in 1979. Famous alumni such as Martin Mosebach, Thomas Rosenlöcher, Rüdiger Safranski, Marcel Beyer, Agus Sarjono and Svetlana Alixejevitch, the 2015 Nobel-prize laureate for literature from Belarus, added to the reputation of Wiepersdorf. After German unification in 1991, Schloss Wiepersdorf remained an Artist Residency. Friedmund von Arnim’s s wife Clara von Arnim, née von Hagens, founded the „Association of Friends of Schloss Wiepersdorf“. She renounced her entitlement to claims for compensation in favor of the State of Brandenburg and secured the transfer of the literary heritage to the Weimar Classic Foundation. For placing public over private interest, German Federal President Johannes Rau awarded Clara von Arnim the Maecenas Prize of the Circle of Independent Cultural Institutes in 1999. Professor Hartwig Schultz, the former Head of the Brentano Department at the Goethe-House in Frankfurt followed Clara von Arnim as chairman until 2013, when Ambassador (ret.) Dr Norbert Baas was elected his successor and has been chairman since then. In 2006, the German Foundation for the Preservation of Historical Monuments (Deutsche Stiftung Denkmalschutz) became owner of Schloss Wiepersdorf. Since then, it is financed and managed in cooperation with the State of Brandenburg. The Association of Friends is working closely with both and it equally benefits from cooperation with the “Goethe-Haus” in Frankfurt, the nucleus of the future Museum of Romanticism in Germany. From 1st January 2020 onwards, the State of Brandenburg will take over responsibiliy to manage the Artist residency. In October 2015, the Association of Friends, in cooperation with the Artist Residency, held a symposium on how the perception of romanticism evolved in East Germany (GDR) over time. The writings of Franz Fühmann and both of Christa and Gerhard Wolf shed new light on German romanticism, which had met with scepticism during the first years of the German Democratic Republic but became more and more accepted and underlined the growing desire for societal transformation and greater freedoms of expression. In 2017, the Association published a book “The Blaue Blume in der DDR – Bezüge zur Romantik zwischen politischer Kontrolle und ästhetischem Eigensinn” (Quintus-Verlag Berlin) with fifteen contributors, edited by Friederike Frach and Norbert Baas. Gifts or membership contributions to the Association of Friends are highly welcome. They are tax-deductible according to German law and used to support fellowships at the Residency and for the museum. To further its mission, the Association is helping establish and strengthen international contacts to benefit the Artist Residency and is seeking additional sources of sponsorship.